while in my sixth year at school, i applied to scotland's art colleges in order that i might further my burgeoning art career at a more prestigious institution. aside from supplying a coherent list of my academic qualifications, it was also necessary to send a competent selection of artworks in a large folder, constructed from coloured paper and card, to support my claim of having any artistic ability at all. bizarrely, the only qualification actually required to enter art college was higher english; it wasn't even necessary to have passed higher art, though i can't say i met anyone in that particular situation. naturally enough, art schools do not possess unlimited storage space, so after having been accepted as a student, the folder was duly returned. such was the superior build of the folder, it not only survived being utilised for my sixth year studies offerings, but was retained at home for any subsequent needs. and lo and behold, just such a situation arose on leaving college. as is often the case in life, it's who you know rather than what, and a friend of my father owned an interior design company with whom he had arranged an interview. in support of my personal appearance, i had been asked to bring along a selection of my work, that they might better assess my eminent suitability. so once again, the large orange folder was pressed into service, containing an agglomeration of sketches, graphics, illustrations and the like. the interview such as it was, took place in the company boardroom, and pretty much failed at the first stop due to my presentation, or rather, lack of. according to the gentleman who let me down gently, the previous hopeful had arrived with videotape in hand (remember those?) and proceeded to impress the minimally assembled multitudes with sound and vision. by comparison, my bits of coloured paper with pen and ink sketches loosely arranged between the card covers seemed positively rudimentary. needless to say, i was not afforded employment. it was, with my honours degree in hindsight, a salutory lesson, one that has subsequently stood me in good stead ever since. for no matter how new, shiny, or revolutionary your latest product, it often comes down to the presentation, particularly when in competition with similar new, shiny and revolutionary products. 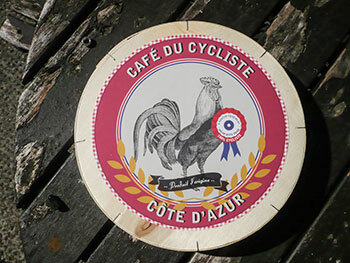 this is quite obviously a concept well understood by remi and emilie at cote d'azur's cafe du cycliste. carefully ensconced within the packaging containing their marie-josette waterproof jersey, previously reviewed in these pixels was a tin of extra virgin olive oil from the cafe du cycliste neighbourhood. nothing at all to do with the jersey, but a very nice prezzy nonetheless. this time round, the henriette jersey arrived with what i took to be a sizeable round of camembert cheese, though indisputably lighter than one would have expected. the round, wooden box contained the cotton cycling cap. now i feel no embarrassment about airing my prejudices, but to be honest, unless the cap fell apart on lifting from its receptacle, there was no way this was going to receive a chilly reception. not only was the container immaculately formed in true camembert fashion, but the round sticker atop the lid bore a verisimilitude of just what you'd expect on the cheese. excellent in the way only true excellence can be presented. you would hardly expect a cycle cap to be reviewed in the manner of a jersey, jacket or bicycle. if the cap fits, etc. 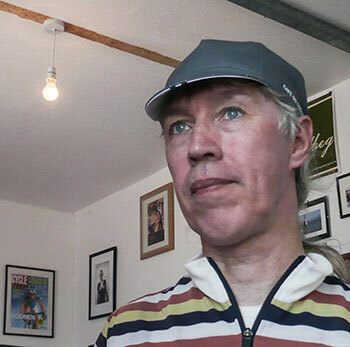 the eight panel, italian made cap is a rather apt, one-size-fits-all casquette, with a white dots on grey top to the peak, and an underside featuring tricolour stripes on white. this, sadly, is an aspect of a stylish piece of headwear that few will ever see round these here parts, for i am a firm believer that real men ride with the peak down. 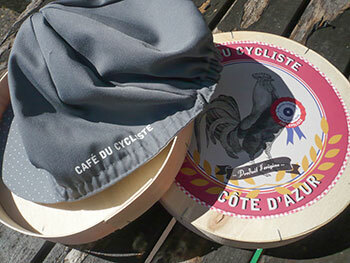 however, the alliterative cafe du cycliste cotton cycling cap deserves at least a few words of attribution. aside from being a well-judged one-size-fits-all, the peak is of decent proportions to shield from the sun (or rain), while not giving the impression of an incoming flying saucer. furthermore, it fitted well under my selection of helmets without interference or discomfort. 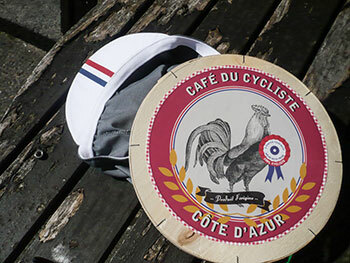 what more can one demand of a casquette? the ancestral lineage is demonstrated by a white silk-screened cafe du cycliste on the right, and there's a logo'd red tab to the rear. it is a truism that one can never own too many casquettes, preferably of impeccable heritage; this is one such. available in blue, grey and cream, as of writing, the blue seems to be strangely out of stock. our appropriately good taste, however, will easily allow us the luxury of ordering one or both of the alternatives. ideal for wearing while munching on oatcakes and camembert.